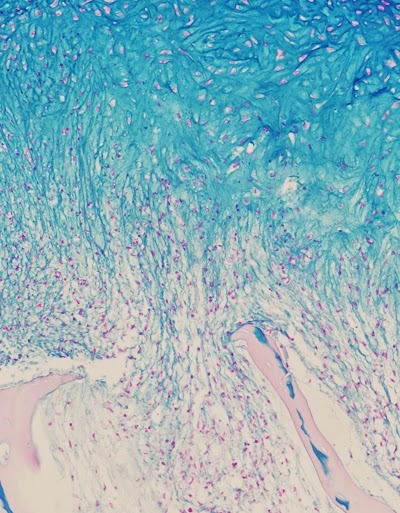 A team of scientists at Columbia Engineering announced yesterday that they have successfully grown fully functional human cartilage in vitro from human mesenchymal stem cells extracted from fat tissue. Their research demonstrates new ways to better mimic the enormous complexity of tissue development, regeneration, and disease and may have tremendous clinical impact in the treatment of osteoarthritis. “We’ve been able—for the first time—to generate fully functional human cartilage from mesenchymal stem cells by mimicking in vitro the developmental process of mesenchymal condensation. This could have clinical impact, as this cartilage can be used to repair a cartilage defect, or in combination with bone in a composite graft grown in lab for more complex tissue reconstruction.” said Gordana Vunjak-Novakovic, who led the study and is the Mikati Foundation Professor of Biomedical Engineering at Columbia Engineering and professor of medical sciences. Full section of a tissue construct with cartilage at the top and bone substrate underneath. The blue stain marks proteoglycan, one of the two key components of cartilage, and red marks the nuclei of the cells. “Our whole approach to tissue engineering is biomimetic in nature, which means that our engineering designs are defined by biological principles. This approach has been effective in improving the quality of many engineered tissues—from bone to heart. Still, we were really surprised to see that our cartilage, grown by mimicking some aspects of biological development, was as strong as ‘normal’ human cartilage.” Vunjak-Novakovic notes. “This is a very exciting time for tissue engineers. 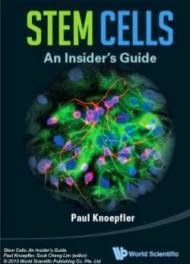 Stem cells are transforming the future of medicine, offering ways to overcome some of the human body’s fundamental limitations. We bioengineers are now working with stem cell scientists and clinicians to develop technologies that will make this dream possible. This project is a wonderful example that we need to ‘think as a cell’ to find out how exactly to coax the cells into making a functional human tissue of a specific kind. It’s emblematic of the progress being driven by the exceptional young talent we have among our postdocs and students at Columbia Engineering.” said Vunjak-Novakovic. The research was funded by the National Institutes of Health (National Institute for Biomedical Imaging and Bioengineering, National Institute for Dental and Craniofacial Research, and National Institute of Arthritis and Musculoskeletal and Skin Diseases).